A pH-balanced, soap-free formulation for deep cleansing without irritation. Regular use will leave the skin with a smooth texture and may help reduce the appearance of fine lines and wrinkles. Pump a moderate amount of foam into hands. Apply to wet skin and cover entire face. Rinse with water. Use twice daily or as directed by a physician. I returned to this product after giving my skin a break because this is the only product that clears up my spots fairly quickly. I use once a day night only to avoid over drying. Summer is here and I hate it when my bare legs show dry skin flakes, but moisturizer frequently makes them feel a bit sticky, especially in bed at night.Instead, while in the shower, after washing, I use a bit of this foaming glycolic wash on my legs, and sometimes my arms if they are looking dry. I let it sit 30 seconds or so, and then rinse off. It spreads well and rinses cleanly. Gets rid of the skin flakes and keeps my legs and arms looking nice without being sticky. I use this nightly per my dermatologist's recommendation; I get a deep clean and great exfoliation for my sensitive skin. One pump is the perfect amount for face & neck, and it rinses easily.I tried my first glycolic peel and was surprised when it barely tingled and there were no after-affects (vs. my friend who was squirming in pain for the application then had a major full-face peeling in the days following). My daily use replaces the value from a peel! Keeps my complexion smooth and glowing! I have tried other products and this by far is on the top of my list. My complexion is smooth and glowing. 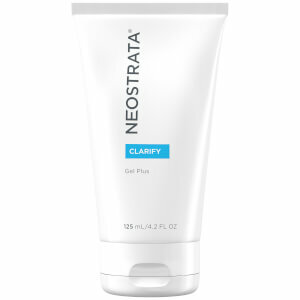 I use all of the NeoStrata products and love them all. I get complements on my complexion all of the time.....and I'm 49 years old and have been in the sun all of my life! I love this! One pump is all that's needed and you can actually feel it working! My skin feels smooth and soft--hardly need a moisturizer afterwards! I use this with the neo-strata daily moisturizer and really see a difference in the texture and apperance of my skin. This product just blows me away. I have dark oily skin. It deep cleans and the high AHA level keeps my skin looking great in between chemical peels. It does a fabulous job of removing flakes and peeling skin so I don't have to use a scrub as often. My skin is softer, smoother and more even toned. No other glycolic cleanser even comes close. I refuse to be without it. Great cleanser for acne prone skin! This really helps to keep my adult acne in check. This has really helped to clear up acne as well as post acne scars. I use with Neostrat face cream plus AHA 15 and it works like a charm. Neostrata can do no wrong! This product is gentle and effective and I use it every morning in the shower. It seems to be lasting a long time, too, which makes it an even better value. I don't love or hate this stuff. It's the first Neo Strata product I've tried (based on recommendations from my stylist and several friends) I've had oily skin and a tendency to break out since my teens. Then my skin calmed down a bit in my 20's. When I reached my early 30's, I began having hormonal breakouts on my jawline and chin. Also, my oily skin became more noticeable. I do like foam products because they don't feel heavy or oily and this one does have a nice, citrus scent. It makes my skin feel clean and evens out my skin tone. I've seen less breakouts on my chin, but now, I'm having occasional breakouts on my forehead and cheeks! Also, my skin felt itchy for the first couple of weeks. Not inflamed or irritated, just itchy. I'll probably shop around for a similar product by MD Forte or MD Formulations.